To be honest, the logo definitely looks perfect. As for the finishing, it could be made better. I liked the idea of the strap logo over the zip. The Captain America logo on the AoU jacket had a classier finishing than this one. Overall, the jacket fits me perfectly; it wasn’t too loose or too tight. It was just about right for my physique, even though I don’t have a very good one. It looks nothing like in the Flash television series; the logo looks weird, but the color of the entire outfit looks good. The fitting is great too but just the logo issue. It’s a great product, but the only con is that the sleeves were a bit long and they covered my hands also. I went for an exchange from the customer service, and they advised to go for a smaller size. The second time the delivery was late, but the jacket‘s sleeves were of the correct length. The logo on the jacket gives the look and feel of Flash. That’s why I like it a lot. I have no complaints with it. I wore this jacket for Halloween and got a lot of good comments from other Cosplayers on its quality. They were impressed with the seller, and they said that they would buy products from the website for their clothing needs. 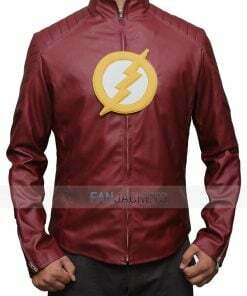 This red leather jacket is inspired by DC comics superhero tv series “The Flash.” The Flash Leather Jacket has viscose lining featured inside that will absorb sweat and enable you to wear it for hours. YKK branded zips are used for the cuffs and front closure that won’t break off so easily. 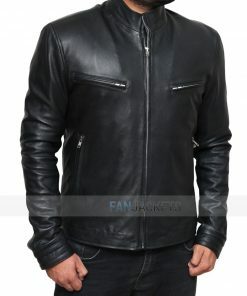 Having a costume’s look in a leather jacket is now possible with this outfit. 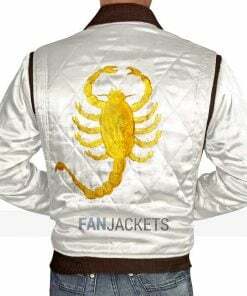 Order The Flash Jacket now and avail free shipping.